Montserrat with its capital Plymouth is located in North America (Caribbean, island in the Caribbean Sea). It covers some 103 square kilometers (about 0.6 times the size of Washington, DC) with 5,292 citizens. English is the official language used in Montserrat. Thiscountry has no land-based border with any other country. Montserrat is an island in the Caribbean, southeast of Puerto Rico. A former popular resort, it is recovering from a hurricane and volcanic activity from the 1980s and 1990s. See the volcano! An observation area on Jack Boy Hill on the eastern side gives a view of the ash flows covering the old airport. Huge boulders may sometimes be seen, crashing down the slope in a cloud of dust. Montserrat is blessed with natural beauty. On land there are lush tropical forests with trails of varying difficulty. Many can be enjoyed on your own, however, some require a guide to make the path clear. Stop by the National Trust our Tourist Information for a map (charge of $10 EC currently). The topography is volcanic island, mostly mountainous, with small coastal lowland. The average density of population is about 52 per km². The climate in Montserrat can be described as tropical with little daily or seasonal temperature variation. Potential natural disasters are severe hurricanes (June to November), Soufriere Hills volcano (elev. 915 m), has erupted continuously since 1995; a massive eruption in 1997 destroyed most of the capital, Plymouth, and resulted in approximately half of the island becoming uninhabitable and volcanic eruptions. To reach someone Montserrat dial +1-664 prior to a number. The local cellular networks are operated on 850 MHz. Websites typically end with the top level domain ".ms". If you want to bring electric appliances (e.g. battery chaarger), keep in min the local 230 V - 60 Hz (plugs: A, B). The sign for the locally used currency Dollar is XCD. 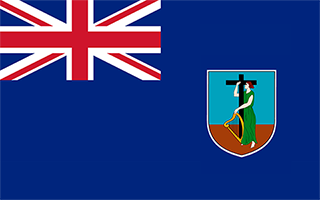 Blue with the flag of the UK in the upper hoist-side quadrant and the Montserratian coat of arms centered in the outer half of the flag; the arms feature a woman in green dress, Erin, the female personification of Ireland, standing beside a yellow harp and embracing a large dark cross with her right arm; Erin and the harp are symbols of Ireland reflecting the territory's Irish ancestry; blue represents awareness, trustworthiness, determination, and righteousness.